Led Zeppelin enjoyed ten years at the top. During their ten years at the top, Led Zeppelin released eight albums. They released their debut album Led Zeppelin in January 1969. Just over ten years later, Led Zeppelin released In Through The Out Door in August 1979. These eight albums sold over 100 million copies and resulted in Led Zeppelin being crowned the biggest band in the world. However, that era was about to end in tragedy. A year after the release of In Through The Out Door, Led Zeppelin began preparing for the 1980 North American tour. The tour was scheduled to begin on 17th October 1980. It would be the first time Led Zeppelin had toured North America since 1977. So Led Zeppelin were keen to make an impression. Rehearsals began a month earlier. On 24th September 1980, Rex King, Led Zeppelin’s assistant, picked John Bonham up at his home. Rex was to drive John to the rehearsals at Cray Studios. However, en route, John asked to stop for “breakfast.” Breakfast for John Bonham was a ham roll and four quadruple vodkas. Once he had his breakfast, Rex took John to the studios, where the rehearsals began. John continued to drink throughout the day. Rehearsals continued into the evening. Then when the rehearsals were over, Led Zeppelin headed to Jimmy Page’s house. Still, John continued to drink. Just after midnight, John had fallen asleep, and had to be helped to bed. By then, John had drunk 1.4 litres of 40% vodka. Just after midnight, John, who had fallen asleep, was put to bed. Despite putting him on his side, John Bonham would be found dead the following day. By 12.45pm, on 25th September 1980 there was no sign of John Bonham. So, Led Zeppelin’s new tour manager, Benji LeFevre and John Paul Jones went to investigate. They found John Bonham dead. He was only thirty-two. Because of the circumstances of John’s death, an inquest was called. Before the inquest, an autopsy discovered that John Bonham had died of from asphyxiation. He had choked on his own vomit, after drinking the equivalent of forty shots of 40% vodka. At the inquest on 27th September 1980, a verdict of accidental death was recorded. By then, John Bonham had been cremated on the 10th October 1980, and his ashes were buried in St Michael’s Church in Rushock near Droitwich, Worcestershire. For the biggest band in the world, it was the end of an era. The three remaining members of Led Zeppelin had a huge decision to make. They were meant to be beginning a lucrative North American tour. However, Jimmy Page, Robert Plant and John Paul Jones were mourning the loss of their friend. The last thing on their mind was music. Despite this, rumours in the music press suggested the tour would continue with a replacement drummer. Names mentioned to play drums on Led Zeppelin’s North American tour included Carmine Appice, E.L.O.’s Bev Bevan, Jethro Tull’s Barriemore Barlow and Free’s Simon Kirke. Cozy Powell who had just parted company with Rainbow earlier in 1980, was said to be a contender. Ultimately, this was mere speculation. The other three members of Led Zeppelin had come to a decision. Led Zeppelin’s North American tour was cancelled. Then on 4th December 1980 Led Zeppelin’s future became clear. The three remaining members of Led Zeppelin issued a press release. It stated: “We wish it to be known that the loss of our dear friend, and the deep sense of undivided harmony felt by ourselves and our manager, have led us to decide that we could not continue as we were.” At the bottom of the press release, it was signed “Led Zeppelin.” After eleven years,Led Zeppelin were no more. That seemed to be the end of Led Zeppelin. The three members of Led Zeppelin went their separate ways. Then in 1981, Robert Plant founded The Honeydrippers. He was joined by Jimmy Page and Jeff Beck. The Honeydrippers’ lineup was fluid, with friends of Robert Plant and Jimmy Page joining a variety of other musicians. This kept Robert Plant and Jimmy Page busy. However, in 1982 a ninth Led Zeppelin album would be released. Led Zeppelin still owed Atlantic Records an album. This dated back to when Led Zeppelin formed their Swan Song label in 1974. However, this wasn’t the official reason. According to Jimmy Page, the three members of Led Zeppelin had noticed how popular bootleg recordings were. They were selling in vast quantities. Given they were unauthorised releases, Led Zeppelin weren’t benefiting from the releases. So the remaining members of Led Zeppelin decided that they should reissue some of the unreleased material in the vaults. With Led Zeppelin having been together for eleven years before John Bonham’s death, there was plenty of unreleased material. There was more than enough for one album. That’s apparent on Warner Bros’ recent triple vinyl reissue of Coda. Not only does it feature the eight tracks on the original version of Coda, but two further discs of unreleased material. There’s eight tracks on the second album, and another seven tracks on the third. Forty-three years later, and the Led Zeppelin vaults are the gift that keep on giving. 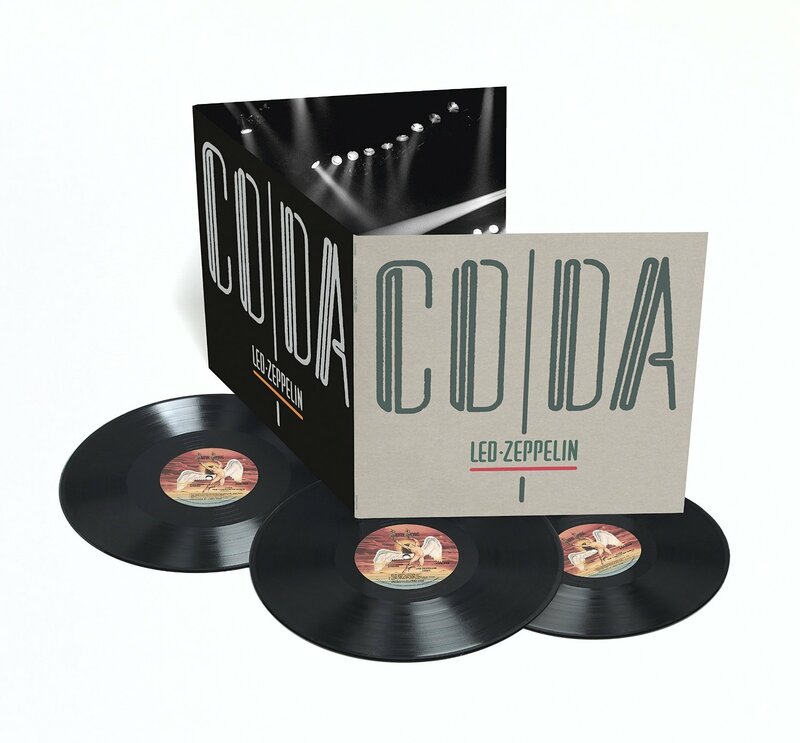 Back in 1982, John Paul Jones saw the release of Coda as an opportunity for Led Zeppelin to showcase some of the hidden gems that lay unreleased in the vaults. Just before the release of Coda, John Paul Jones explained why the album was being released. After all, some of the eight tracks had been recorded some time ago? “They were good tracks. A lot of it was recorded around the time punk was really happening.” Most of the music was released John Paul Jones explains. “There wasn’t a lot of Zeppelin tracks that didn’t go out. We used everything.” Some of the music that hadn’t been released would feature on Coda, which was a fitting title to what was Led Zeppelin finale. When looking for a title for Led Zeppelin’s ninth and final album, a musical term was chosen…Coda. It proved to be a fitting description of what the album was. A Coda, the three remaining members of Led Zeppelin explained, “was a passage that ends a musical piece following the main body.” In the case of Led Zeppelin, In Through The Out Door was the last album in their main discography. Coda was an addendum, featuring tracks recorded between 1970 and 1978. For Coda, the three remaining members of Led Zeppelin searched through the band’s vaults. They were looking for songs that would be fitting farewell for their fallen comrade. After much consideration, Jimmy Page, Robert Plant and John Paul Jones decided on eight tracks. They became Coda. Opening Coda, was the bluesy We’re Gonna Groove, which was recorded on 9th January 1970, at the Royal Albert Hall, London. However, the guitar parts were later removed, and over-dubbed in the studio. Poor Tom was originally meant to feature on Led Zeppelin III. It was penned by Jimmy Page and Robert Plant. Once the recording of Led Zeppelin III was complete, Poor Tom was omitted from the final album. It’s vintage Led Zeppelin. Another track from the Royal Albert Hall Concert on 9th January 1970, is a cover of Willie Dixon’s I Can’t Quit You Baby. Willie Dixon originally wrote the song for Otis Rush. Later, it became a favourite of Led Zeppelin, who reinvent the track. Closing side one of Coda, was Walter’s Walk which was recorded on 15th May 1972. It’s thought that the vocals were over-dubbed at a later date. Originally, Walter’s Walk was meant to feature on Houses Of The Holy, but was omitted from the final album. Ten years later, it’s rediscovered and comes to light on Coda. The majority of side two of Coda are outtakes from the In Through The Out Door sessions. This includes Ozone Baby, a Page and Plant composition. It’s followed by Darlene, which is credited to the four members of Led Zeppelin. Just like Ozone Baby, Darlene failed to make it onto In Through The Out Door, which despite mixed reviews, still managed to sell six million copies in America alone. Bonzo’s Montreux, which was recorded in September 1976, at the Mountain Studios in Montreux, Switzerland features drumming masterclass from John Bonham. Despite the years of excess, he puts the pretenders to his throne to shame. After the recording of Bonzo’s Montreux, Jimmy Page added a myriad of electronic effects. This adds to what’s one of the highlights of Coda. Why it doesn’t close Coda, seems a strange decision? That would’ve been a fitting homage to John “Bonzo” Bonham. Instead, the Page and Plant penned Wearing Baby closes side two of Coda. It features Led Zeppelin kick loose, and remind the listener why the sold over 100 million albums in just ten years. Led Zeppelin in full flight was a joy to behold. Sadly, Coda was their swan song. What did critics think of Coda? Just like previous albums, critics weren’t impressed by Led Zeppelin. It was a familiar story. Reviews were mixed. Some critics panned Coda. They described the album as a mixed bag of songs. Others saw it as Led Zeppelin fulfilling their contractual obligations. However, if the truth be told, Led Zeppelin were never flavour of the month among critics and cultural commentators. Many of them never gave Led Zeppelin the credit that they deserved. Especially during the punk era. Rock groups like Led Zeppelin were seen as musical dinosaurs, who were to be slain by a new breed of gunslinger critics. Ironically, many of the same critics later rewrote musical history, when they changed their mind about Led Zeppelin. Sadly, when Coda was released, Led Zeppelin had few fans in the music press. Sadly, when Coda was released on 19th October 1982, it wasn’t a huge success. That’s despite reaching number four in Britain, and number six in the US Billboard 200. This resulted in Coda being certified platinum in America, and silver in Britain. When this was translated into sales, Coda sold one million copies in America and 60,000 in Britain. It was a far cry from 1971s Led Zeppelin IV which sold twenty-three million copies in America alone. Then 1973s Houses Of The Holy sold eleven million and 1975s Physical Graffiti sold a further sixteen million copies. In the space of three albums, American record buyers bought fifty copies of Led Zeppelin albums. It’s no wonder that Coda was seen as a commercial failure. That was the case elsewhere. No longer were Led Zeppelin topping the charts. Only in Australia, Canada and New Zealand did Coda enter the top ten. Led Zeppelin’s time had been and gone. The group who for several years had been the biggest band in the world were history. After Coda, the three members of Led Zeppelin went their separate ways. In the case of Robert Plant and Jimmy Page, they spent the next few years on The Honeydrippers. However, never again did Led Zeppelin record another album. That was fitting. Led Zeppelin’s success was down to the four members of the band, not just three. The music on Coda was proof of this. Each and every track features the four members of Led Zeppelin. That’s the case on the three disc version of Coda which was recently released by Warner Bros.
From the opening bars of We’re Gonna Groove on disc one, right through to the Rough Mix of Everybody Makes It Through (In The Light) that closes disc three, the four members of Led Zeppelin play their part in the sound and often, the success of the music. The second album two features just eight track. Three of the tracks on disc two, feature alternative versions of songs from Coda. There’s an alternate take of We’re Gonna Groove, a mix construction in progress of Bonzo’s Montreux and an instrumental mix of Poor Tom. The inclusion of this version of Bonzo’s Montreux is an interesting one. Usually, recordings like this would never be released. They’re reference tracks only. So, it allows listener to see how the track evolved. Just like disc two, the seven tracks feature alternative versions of songs from Coda.There’s a rough mix of Bring It On Home from Led Zeppelin II, and Walter’s Walk, which which was recorded in 1972 for the Houses Of The Holy album. However, Walter’s Walk was never released until it featured on Coda. The version on disc three is just a rough mix. That’s the case with St. Tristan’s Sword, Desire (The Wanton Song) and Everybody Makes It Through (In The Light) which was recorded for the 1975 album Physical Graffiti. These tracks are work in progress, and allow listeners to compare and contrast with the finished article. Four Hands (Four Sticks) was recorded in 1971, and featured on Led Zeppelin. It was also the B-Side to the single Rock ’N’ Roll. However, the version on disc three is the Bombay Orchestra version. It was recorded in 1972, and features the Bombay Symphony Orchestra. They also feature on Friends, which was recorded at the same time. Both tracks feature a very different side of Led Zeppelin and are a welcome addition to disc three of Coda, which closes the Led Zeppelin remaster series. It’s taken just over a year for Atlantic and Warner Bros. to rerelease the nine Led Zeppelin albums. These nine albums were released between 1969 and 1982. During that period, Led Zeppelin sold over 100 million albums and became the biggest band in the world. However, like all good stories, the Led Zeppelin story had to come to an end. When the end came, there was a twist in the tale. The four members weren’t going to live happily ever after. No. Drummer John Bonham, the hardest living member of Led Zeppelin died of asphyxiation on the 25th September 1980. He had choked on his own vomit, after drinking the equivalent of forty shots of 40% vodka the day before. That day, Led Zeppelin died too. Less than three months later, on 4th December 1980, the other three members of Led Zeppelin announced that the biggest band in the world were no more. They had overlooked the fact that they owed Atlantic Records one album. So, just under two years later, on the 19th November 1982, Led Zeppelin released Coda. It was a selection of unreleased tracks. While Coda was hardly Led Zeppelin’s finest hour, just like In Through The Out Door, it featured fleeting moments of genius. However, it was a far cry from their first six albums. From Led Zeppelin right through to Physical Graffiti, Led Zeppelin could do no wrong. However, on Presence and In Through The Out Door, no longer were Led Zeppelin invincible. There was a chink in their armour. What’s more all the years of hard living caught up with Led Zeppelin. By the time they were recording In Through The Out Door, Jimmy Page was struggling with heroin addiction, and John Bonham was battling alcoholism. Sadly, just over a year after the release of In Through The Out Door, John Bonham lost his battle with alcoholism on 25th September 1980. The day, that John Bonham died, so did Led Zeppelin. The ideal ending to the Led Zeppelin story would’ve been of the three remaining members of the band pieced together a critically acclaimed album featuring unreleased tracks. Sadly, that would only happen in the movies. Instead, Coda proved to be what critics called a musical mixed big, that became Led Zeppelin’s least successful album. Coda became a Coda to Led Zeppelin’s eleven year career, where they sold over 100 million albums. ← STEIN URHEIM AND MARI KVIEN BRUNVOLL-FOR INDIVIDUALS FACING THE TEROR OF COSMIC LONELINESS.